Customer requirements: the customer requires related products according to the existing film. The original film is used on the flow pack wrapper. Now it should be used on the vertical form fill seal machine. How we solve this: we exchanged the package width and length so that it can be used on the vertical form fill seal machine. 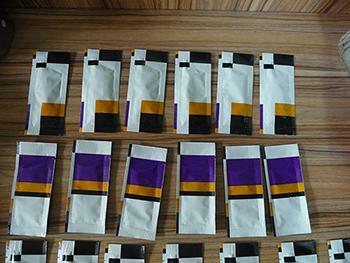 This kind of packaging system can produce 3 side seal pouches and 4 side seal pouches. 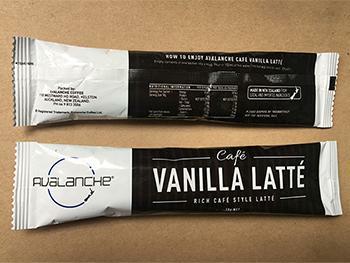 The size of the pouch can be adjusted. If the size should be changed, you only need to exchange the bag forming device. This type of packaging equipment is mainly used for food packaging and pharmaceutical packaging, sugar and coffee packaging. Customer requirements: the liquid to be filled is 1ml. The cutting of the package is flat. The packaging has easy tear notch on two sides and design of outlet. The later requirements was the film winding unit should be covered with PMMA. 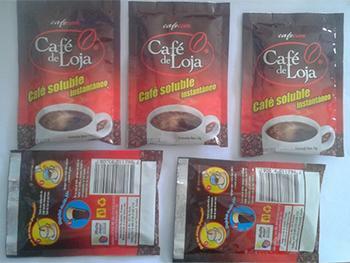 How we solve this: we design the packaging bag style according to the requirements of customer. The machine is equipped with 2 cutter. Besides, the packaging line is equipped with PMMA protective cover. And the packaging equipment is equipped with a 1-10ml piston pump. 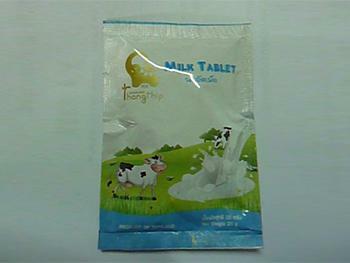 Product features: this type of packaging system can realizea 3 side seal pouch and 4 side seal pouch. The size of the pouch can be adjusted. If the size should be changed, you only need to exchange the bag forming device. Customer requirements: the customer requires that 2 vertical form fill seal machines are connected using one feeder. And the packaging should be accomplished automatically. Besides, the bags of this customer is 180mm in length. Solution: we prolonged the longitudinal heat-sealing block of the original powder packaging machine to 220mm so that the length of the packaging bag can be ensured. Besides, the feeder is equipped with a Y style material feeding and distributing hole which can ensure the function that 2 vertical form fill seal machine shares one feeder. Product feature: by adjusting the structure of the machine, this powder packaging system can produce long package bag. This vertical form fill seal machine is mainly used for food packaging industry such as tea powder and flour. Customer requirements: they wanted to customize a sealing mound on the base of the original liquid packaging machine. We need to design the drawings for our customers to confirm, then to process and manufacture to ensure that the machine can perfectly meet the requirements of our customers. Solution: this kind of liquid packaging system can adopt long packaging bags which can be used for packaging of various sauces. Only the valve needed to be changed if our customer only requires packaging of liquid. This kind of packaging equipment is mainly used for thick liquid in food packaging industry such as ketchup, honey, soy sauce etc.